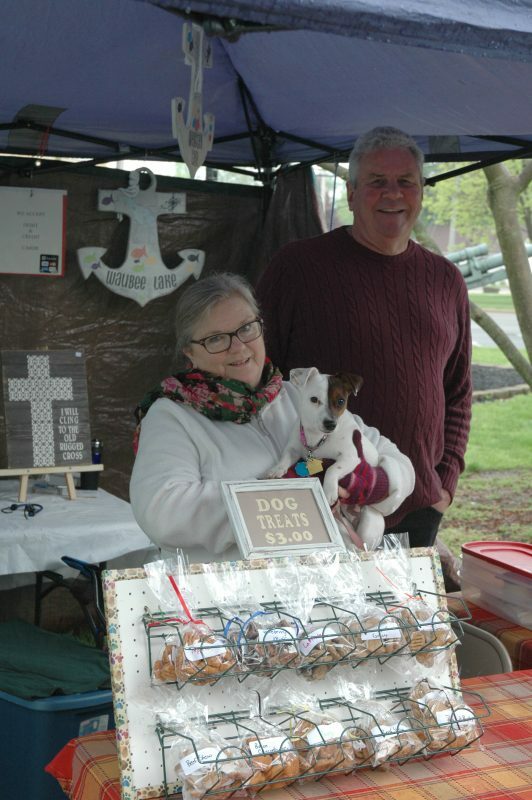 Despite Mother Nature’s furious objections, the 2018 Syracuse Artisans and Farmers Market celebrated its inaugural weekend Saturday, May 12, at Veteran’s Memorial Park at Crosson Mill in downtown Syracuse. Pelting rains, lightning and temperatures in the 40s failed to scuttle the optimistic venture, which saw 11 intrepid vendors pop their canopies, open shop and ride out the downpour that racked the area shortly after the 9 a.m. start time. After the initial deluge and a lonely wait by the vendors, customers began to arrive mid-morning, browsing the displays of homemade produce and goods and salvaging what might have been a financially hapless day. The vendors’ doggedness in the face of prohibitively inclement weather is no surprise. “We have never cancelled the market in the 10 years it has been running,” said Kathie Kenworthy, who was on site, filling in as marketing manager for the Syracuse Parks and Recreation Department, who hosts the weekly events. “We let the vendors decide whether they want to set up in weather like this,” she said, noting 11 of the 15 scheduled vendors for the day decided to brave the storms. During the summer vacation season, up to 36 vendors will take their designated places in the small park across from town hall. “It is a really nice market for this small a town,” said Kenworthy. “We still have openings for vendors,” she said. Sale items are required to be handcrafted or locally grown. Saturday’s inventory included produce, baked goods, soaps, candles, scarves, purses, baby items, spices, candles and melts, essential oils and dog treats. Perishable goods were hardest hit by the weather. Ruby Bontrager offered baked items to the few patrons happening by in the morning. She marked all her homemade stock at half-price and was anticipating a fair amount of leftovers. Bontrager kicked around several ideas for distributing her leftovers, including taking some to her church for their Sunday coffee hour and donating some to a local nursing home and food pantry. Judy Sharp of Milford, one of the market’s charter members, remarked about the vagaries of northern Indiana climate. “We have had some pretty bad days,” she said. Karla Elliott drives in from Ligonier every Saturday with her stock of homemade soaps, candle melts and tarts and a variety of essential oils. “This market has been very good for me,” said Elliott, now in her sixth year at the market. 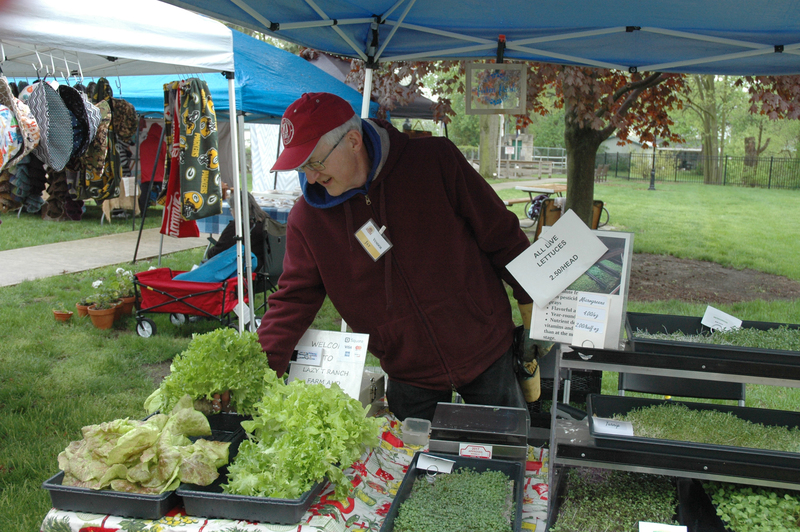 The artisans and farmers market is open 9 a.m. to 2 p.m. Saturdays and will run through October, ending with a fall festival the end of October at Lakeside Park in Syracuse. Kenworthy said the market will hold a monthly kids program starting in June. “This year we’ll have some type of produce activity, where children can taste or make their own snack out of some of the fresh produce from the market,” she said. For more information, call the Parks and Recreation Department at (574) 457-3440.